Facebook and Google are two of the most used and even most loved websites on Internet. They both have millions of users. Facebook help us to connect with our friends, family members and followers and on the other hand, Google, the giant search engine, is like our home tutor which has hundreds of products and features. With these sites, you can easily maintain your personal and business life simultaneously. But did you know how both of them are related with each other? Let me explain it deeply. As you'll search something on Google, it will show you the most relevant results. Good thing is that, Facebook webpages are also indexed by Google. For example, If you'll search for "Wikipedia" keyword, in first result page, you'll find the official Facebook page of Wikipedia. This drives decent traffic to Facebook from Google. In the same way, Google also index Facebook profiles in its search result pages. If you'll search for the person's name on Google, it will first show you the Facebook and Twitter results. You've full control over your account settings and you can index or de-index your profile in Google any time. If you want to know how to do that, this tutorial is especially for you. First you should know about the current status of your profile that whether it is already indexed or not. Here's how to find it. Is your profile already indexed by Google? To find out whether your profile is indexed in Google or not, simply open Google homepage and search for your first and last name and add "Facebook" keyword after it. You can also add your work place, education, website and about bio details to narrow down the search results. 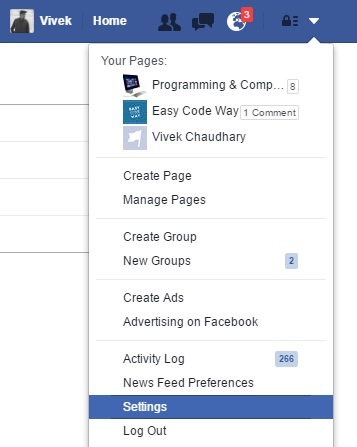 In the following page, you'll find all Facebook profiles with the same name as you've searched. Here find your personal profile. It may be on second, third or fourth page. Just keep searching. If you could not find it, this doesn't mean that your profile isn't indexed in Google. You can give a last try by searching your profile link directly. If you don't know what your profile link is, first login to your Facebook account and go to your timeline. Now look at the URL of the page. That is your personal profile link which is unique and same as your username. Simply copy this link and then search it on Google. This time, it may show you the right results. If it's there, this means that your profile is already indexed and if you're unable to find your profile, then most probably, it isn't indexed. As you can see in below picture, my profile is already indexed by Google. First of all, login to your account and click drop-down arrow icon at the top-right corner of the page (the same button from where you logout the account). After this, move to "Privacy" tab. Under "Who can look me up?" section, click the edit link next to "Do you want search engines outside of Facebook to link to your profile?" option. 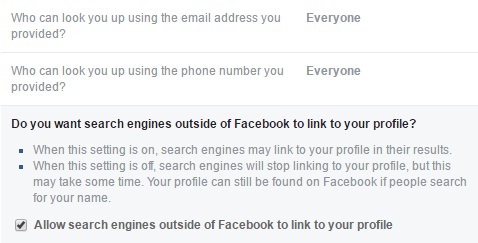 Now tick mark or un-check "Allow search engines outside of Facebook to link to your profile" option to index or de-index your profile respectively. When this setting is on, other search engines (such as Google, Yahoo! or Bing) will index your profile in their search result pages. On the other hand, when this setting is off, search engines will stop linking to your profile and de-index it automatically. Any change you will make will not be applied instantly. It will take some time for Google to index or de-index your profile. Speaking frankly, there is no fixed time period. It may be 1 or 2 days or as long as 2 weeks. You've to check it manually time to time with the same process as explained in about part. This section is for advanced users who want to know about the basic logic behind this process. First let me tell you how Google index webpages in search result pages. Each website has its own sitemap (a simple xml page) which contains all of its webpages and directory in an organized way. Search engines sends a web crawler (also known as spider or bot) to crawl website data which visit the sitemap and then navigate to all the webpages. If new updates or changes were found, bots will automatically indexed them in search result pages. Site owners have full control over their website and they can even block links which they doesn't want to index in search result pages. This can be done in two different ways. Either by using robot.txt file or by using meta tags. Robots.txt is simple text file which instruct web crawler or robot on how to crawl and index data. If site owner will disallow a particular directory in robot.txt file, then search engine can't be able access it. In the same way, if you'll add a noindex meta tag in a particular webpage, it will prevent search engines to index it. This is what happens with your Facebook profile. If you'll de-index it, Facebook will either move it to the disallowed directory or add a noindex meta tag in the HTML code. When Google bot will visit your profile next time, it will automatically remove it from search result pages. 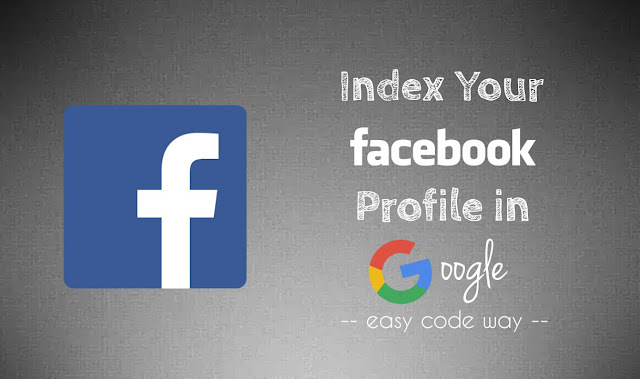 This is how Google index and de-index your Facebook profile in its search results page. If you've any questions, feel free to ask me in below comment box. Stay tuned for more interesting tutorials. Your article caught my attention and I tried to look up my name in Google search. Guess what! I found it! It was a link number two from the top. Since there’s no need for me to de-index my personal data, I’ll leave it there. By the way, I got some more information related to this topic. Would you like to check it out? Then see deindex.pro.